This is an LA West Side Story. Every week the New Renaissance Film Festival selects a Film of the Week from all the received submissions. We post the TRAILER and a bio of the filmmaker on our website and social media to highlight their project. 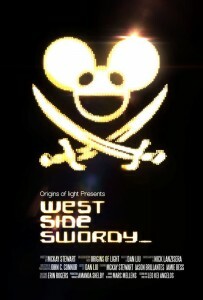 This week, congratulations goes to ‘WEST SIDE SWORDY’. The Jets chase the Sharks through an alleyway and up over a tall fence, when suddenly they find themselves in another world, magically transported into an abandoned warehouse. Where they are controlled by the electronic beat of world-renowned disc jockey, Deamau5. This is an LA West Side Story. McKay Stewart originally wanted to create a sword-fighting reel to try and help him and a few fellow stunt performers get jobs on the Pirates of the Caribbean movies. No joke! But then, he wanted it to be special, to have real production value, have a story. In essence, a short film. Dan Liu is an editor of AMC’s The Walking Dead, John T. Connor has shot features for the best in the business, including Ridley Scott, JJ Abrams and David Fincher; Nick Lanzisera has danced and choreographed on some of the hottest shows around, like True Blood, Footloose and High School Musical. 20th August 2016. A prize will be given to the overall winner. NRFF London is now open for short film, documentary, animation and music video submissions. Enter your film today!